Saturday, Sept. 8 kicked off the cross country season for the Tech men’s and women’s teams as they competed in the Bulldog Invitational in Athens, featuring runners from Tech, UGA, Augusta, Georgia State, Kennesaw State and North Georgia. For the next month, both teams will fiercely compete to prepare for the ACC Championship on Oct. 26 in Jamaica Plain, Mass. Coming into the season, the Jackets men’s team ranked No. 9 out the 15 ACC teams and the women’s team ranked No. 12 on the preseason ACC coaches’ poll after placing No. 8 and No. 12 respectively at last year’s ACC Championships. The rosters of both teams are comprised of veteran runners aiming to repeat their success as well as new faces looking to make an impact on the team. While not earning stellar preseason rankings, both teams impressed as they brought home the win in Athens with multiple standout individual performances. As a part of their victory, the women’s team managed to defeat the No. 19 nationally ranked Bulldogs women’s team on their home field, making the win that much sweeter. The women’s team, who competed in a 5500-meter race, had five runners finish in the top 10. Among the top finishers was senior Mary Prouty, who finished second overall with a career best 20:27.1. Although the veteran competitors on the women’s team performed well, the Jackets had some young talent step up too. Freshman runner Mary Kathryn Knott finished in the top ten of the race and subsequently earned the ACC Freshman of the Week award for her performance. It is rare that a freshman places so well in her first career race, and Knott’s running earned her the prestigious accolade. Although the Tech team had some top-placing times, the depth on a cross-country team makes all the difference; after all, it is a team sport. On the other hand, the men’s team won the Invitational as favorites in a 7600m race. As Coach Drosky put it, “the men were the strongest team on paper,” courtesy of ramblinwreck.com. Still, considering the unforgiving heat during the competition, anything could have happened. It is reassuring that the men’s team was able to play up to, if not exceed, expectations and bring home the win. The men were led by All-American runner Avery Bartlett, who finished as the top runner in the men’s race. Originally a strictly track and field runner at Tech, Bartlett has since brought his talents to the cross country team where he currently leads as the number one runner on the team. Bartlett ran a personal best 24:20:7 in Athens, helping the team convincingly topple the Bulldogs by more than 30 points. To contribute to that 30-point differential, the Jackets were also able to secure a few more top-10 finishes with junior Andrew Kent securing second place in the competition and Matthew Munns finishing tenth. Similar to the women, the men’s team also had a standout freshman performance with Braeden Collins running a 24:44:1 to earn seventh place. Both cross country teams got off on the right foot this season, but the ACC is a highly competitive division led by repeat winners in men’s and women’s. NC State is the team to beat on the women’s side of the division, as they have won the ACC twice in a row and are looking to make it three this season. As for men’s teams, Syracuse has proven to be a juggernaut after their fifth straight division win last year. And the Jackets’ win against a few teams at a local invitational is in no way compelling evidence that they will seriously contend for an ACC Championship; too much season is left for that to be anywhere near decided. 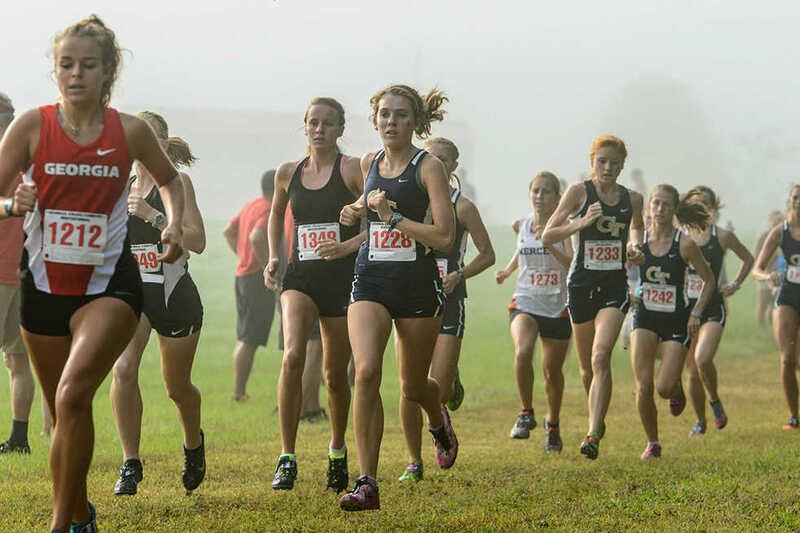 Yet unlike football and basketball, the cross-country season does not start with pushover opponents, and what happens at the beginning of the year does matter. The Jackets can take their performance at the Bulldog Invitational as proof positive that they have the depth and top-level talent to compete with and even vanquish ranked teams like Georgia. Perhaps it will give them confidence against top opponents. It will not be easy for the Jackets teams to ascend the ladder in ACC rankings, but they will have a chance to climb the next rung on September 21 at the Coast-to-Coast Battle in Beantown.